Back in August, I spent a fun day playing seaport tourist, including a tour of the replica HMS Bounty as she was making a port call in Bridgeport, Connecticut. PORTSMOUTH, Va. (AP) — The Coast Guard rescued 14 members of a crew forced to abandon the tall ship HMS Bounty caught in Hurricane Sandy off the North Carolina Outer Banks and continued the search Monday for two other crew members. 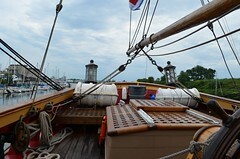 The director of the HMS Bounty Organization, Tracie Simonin, said the tall ship had left Connecticut last week en route for St. Petersburg, Fla.
Coast Guard Vice Adm. Robert Parker, Operational Commander for the Atlantic Area, told ABC’s "Good Morning America" that at the time of the distress call the ship was taking on two feet of water an hour. He said the crew abandoned ship into canopied, rubber life rafts with about 10 feet of water on board. Originally posted at http://edschweppe.dreamwidth.org/153846.html - comment wherever you please.